(From left to right) Political Pundits Jim McQueeny, Nick Acocella, Michael DuHaime and Maggie Moran. In less than four weeks, New Jersey will elect a new governor. Despite numerous third-party candidates, the race is essentially between Republican Kim Guadagno, the sitting lieutenant governor, and Democrat Phil Murphy, a former Goldman Sachs executive and former U.S. Ambassador to Germany. So what will the next governor mean for the business community? NJBIA brought together three of the state’s top political experts this morning to assess where the race stands now and look into the future of what a Murphy or Guadagno administration may mean for New Jersey businesses. DuHaime said that putting aside the candidates’ similar business philosophies, Murphy has promised a lot of government spending to a lot of different groups. Where does that money come from? Moran disagreed. First, she said, Murphy’s experience at Goldman Sachs has shown him that tax hikes on things like professional services would hurt the economy, and pointed out that he supports eliminating the estate tax. Second, groups in Trenton like NJEA and the CWA are much more pragmatic than they have been in the past.“They fully understand that this economy has to grow before they’re going to get” the funding they want, she said. 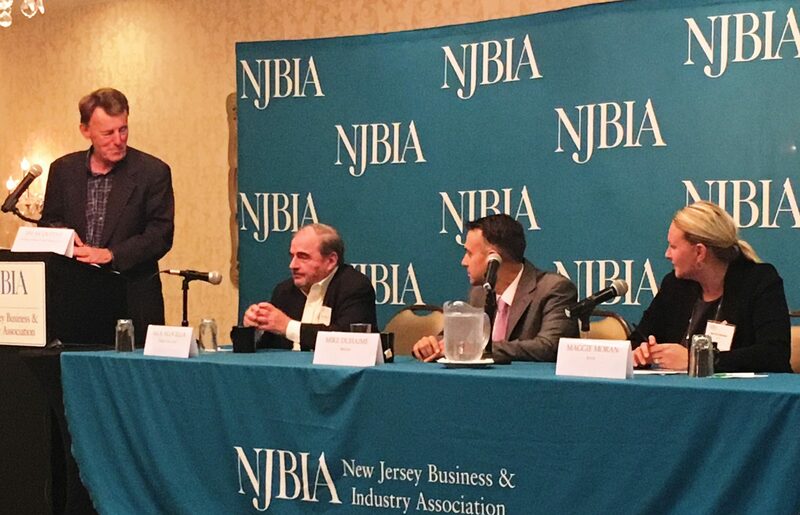 Businesses, meanwhile, have a good opportunity to be part of the conversation thanks to Opportunity NJ, a 501(c)3 co-founded by NJBIA and the NJ State Chamber of Commerce. “One of the things that hasn’t happened in the last 20 years since I have been around in New Jersey is that the business community didn’t have a cohesive advocacy program to really explain the unaffordability of the state,” Moran said. The business community will be successful if it pursues a reform agenda that makes it easier to grow businesses while enhancing the state’s ability to succeed, much like last year’s initiative to renew the Transportation Trust Fund while enacting comprehensive tax reform, Moran said. DuHaime pointed out that as lieutenant governor, Guadagno has spent the last eight years working with business and can be expected to have more of an open door to business groups. Another factor to consider, Acocella said, is the state’s finances. Whichever candidate gets elected is going to have little room to maneuver. After the election “you’re going to see a narrowing of interests where this organization and labor are going to get pieces of what they want. But there’s not enough to go around to get a lot of what anybody wants,” Acocella said. Murphy began the debate talking about an underfunded education fund and how’d he like to properly fund. He mentioned the average of 53% of property tax goes to education yet NJ has the highest property tax in the country. Assuming he’s a Goldman Sachs numbers guy, I’m confused as to how he will afford all of that and keep a promise of funding the glutenous pension fund? Murphy already stated he WILL increase taxes. Having listened to Kim Guadagno at a NJEMA conference over the summer and then having had the opportunity to meet her face to face, she embodies everything good for this State. She is a no nonsense, sensible, leader who has brought business back from the grave in NJ. She is lauded by emergency management, law enforcement, business leaders and municipal officials on both sides of the aisle for her hard work and support of communities and businesses that were affected by the slew of natural disasters that occurred over the past 8 years, including tornadoes, blizzards and Super Storm Sandy. I just hope NJ voters recognize she is her own person, has a proven track record of real accomplishments, including overseeing economic growth and development, as well as streamlining regulations. I believe she genuinely cares about the people of this State, is not a Chris Christie puppet, and will hold the line on taxes.